A new program at Acadia National Park is for people who love visiting the park with their dogs. The Bark Ranger Program encourages dogs and their people to complete at least one activity geared toward teaching and practicing the etiquette needed when dogs visit wild places like Acadia. After completing one or more activities, a free wallet-sized certificate will be signed by a park ranger, to honor the commitments between people, their dogs, and Acadia National Park. 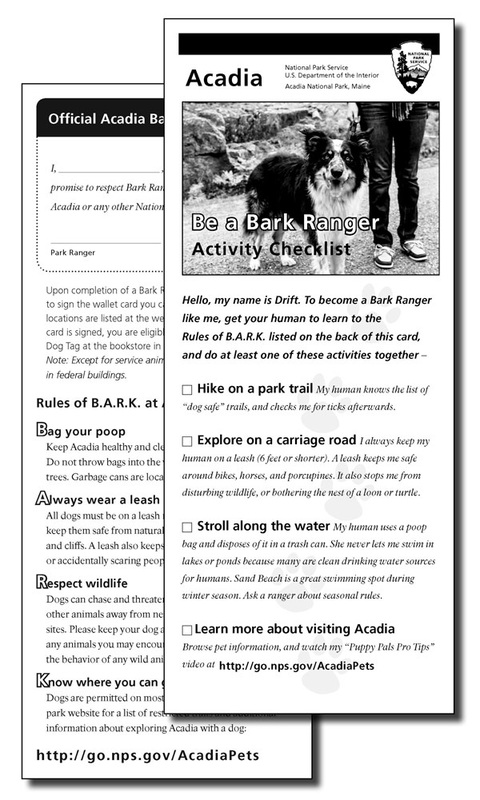 In addition to the certificates, the Bark Ranger Program has other offerings including a free evening ranger program offered at the Seawall Campground and the Schoodic Woods Campground, dates and times are listed on the Acadia National Park “Things to Do” website at http://go.nps.gov/Acadia2Do. And, if you would like your dog to have a Bark Ranger collar tag or bandana, these items are available for sale through the Eastern National Bookstore located at Hulls Cove Visitor Center and other locations. To learn more about the program visit http://go.nps.gov/AcadiaPets or contact Kelly Pontbriand, 207-288-8805 or kelly_pontbriand@nps.gov.